QuestingHound Technology Partners' print server solution allows your company all the network administration capabilities you are looking for in a company-wide print server. It provides a central hub where administrators can manage which users have access to which printing options. 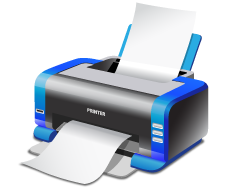 User print configurations are fully customizable and provides administrators control over user-access to the networks printers. These permissions can be adjusted per user to meet the user's needs on the network. Another way strong print management can save you money and streamline your printing operation is by effectively eliminating your older and inefficient printers. If your current printing situation is made up of random printers installed on your network, then it may be the case that some of them are draining your office supply budget. This is because some printers cost a lot more to maintain than others. With print management from QuestingHound Technology Partners, we can identify the inefficient printers and recommend an economical solution. A business may employ strong network security solutions to keep hackers from accessing their sensitive information, but because the printer is often overlooked as an access point, targeting printers on a network is a favorite tactic used by hackers. A print server from QuestingHound Technology Partners will provide your business with an extra level of security that will close that avenue of access. For more information about QuestingHound Technology Partners' print server solution, or any of our other comprehensive IT services, please call us at 954-727-2200 and one of our experienced technicians will assist you.